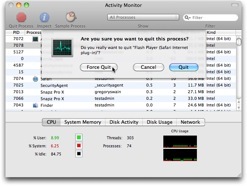 Activity Monitor, located in the Macintosh HD > Applications > Utilities folder, is particularly suited to troubleshooting performance problems, such as the Spinning Beach Ball of Death (SBBOD) and general system sluggishness. 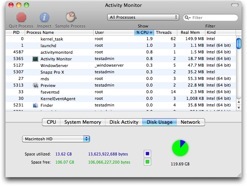 For example, Activity Monitor can be used to determine if your Mac has sufficient resources  CPU, RAM, and free space on your startup disk  for your daily workload. If your Mac regularly performs poorly or your work is frequently interrupted by the SBBOD, your computer may be lacking in one or more of these necessary resources. This is especially true if your work primarily involves notoriously resource-intensive applications, such as multimedia editing, financial modeling, or scientific computing. To learn all that Activity Monitor can do, read its Help: in Activity Monitor, choose Help > Activity Monitor Help. Checking free space on the startup disk. Finding and terminating errant processes. To open Activity Monitor, double-click its icon in the Macintosh HD > Applications > Utilities folder. The top section of the Activity Monitor window is dominated by the process list. This list shows both open applications and background  aka system  processes. Technically, the operating system regards both user applications and system processes simply as processes. You can adjust the size of the process list by dragging the sizing handle in the lower-right corner of the Activity Monitor window. You can choose the columns of data shown in the process list in the View > Columns menu. You can sort the process list by clicking column headings until they appear in the desired order; the current sort column is highlighted and contains an arrowhead denoting the order. You can choose the frequency at which information in the Activity Monitor window is updated in the View > Update Frequency menu. The bottom section of the Activity Monitor window contains tabs for displaying different panes of information. The tabs are labeled CPU, System Memory, Disk Activity, Disk Usage, and Network. Clicking a tab displays a pane of information about that aspect of your Mac. Each pane shows associated real-time statistics and one or more related graphs. Choices in the View > Dock Icon menu can set the Dock icon for Activity Monitor to display one of the graphs for easier monitoring of a specific parameter, such as CPU usage or System Memory. Details will be provided later in this FAQ. Advanced users may note that Activity Monitor is a Graphical User Interface (GUI) to many of the statistics provided by the Terminal command top. The Central Processing Unit (CPU), aka processor, is the part of your Mac that executes instructions, such as running the operating system and applications. It is the engine of your Mac. Unfortunately, if the CPU does not have the horsepower required for your type of work, your Mac will perform poorly and you may be frequently interrupted by the SBBOD. 1. Open Activity Monitor, located in the Macintosh HD > Applications > Utilities folder. 2. Click the CPU tab. 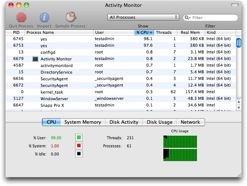 The CPU pane appears in the lower section of Activity Monitor. An errant process is monopolizing the CPU. See "Finding and terminating errant processes" later in this FAQ. Your daily workload requires a more powerful CPU. The left side of the CPU pane shows the percentage of CPU used by different process categories. The two most important are % User  processes running in logged-in accounts  and % System for system-related processes. To see a definition for a category, hover the mouse pointer over the label, e.g. % User, and a help tag will appear. The right side of the CPU pane displays one or more dynamic graphs  time series  showing CPU usage over time, color-coded by process category. There is one graph for each processor core, indicating the CPU usage in that given core. In addition to the CPU pane, Activity Monitor offers two additional methods of watching CPU usage: in the Dock icon for Activity Monitor itself or in a persistent or floating window. In Activity Monitor, choose View > Dock Icon > Show CPU Usage. 1. Control-click the Dock icon for Activity Monitor icon. 3. Choose Show CPU Usage. The Dock icon for Activity Monitor becomes a set of real-time bar graphs of CPU usage, with one bar for each processor core. CPU Usage for a persistent, floating CPU usage window. 1. Control-click the Activity Monitor icon. Show CPU Usage to display CPU usage in a persistent window. Floating CPU Window, then choose the desired orientation (Horizontal, Vertical, or None). The selected window type opens, usually in a lower corner of the display. Note that the persistent or floating CPU usage windows may not appear if the Dock icon for Activity Monitor has been set to Show CPU Usage. If your CPU is not up to the task, you must either upgrade to a new Mac or attempt to conserve CPU resources by running fewer applications concurrently. Applications and processing on your Mac require physical random-access memory (RAM). The more applications you open or the larger the files those applications work upon, the more RAM is consumed. 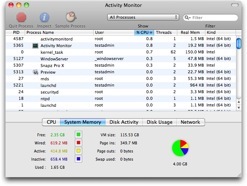 To use the available RAM efficiently, Mac OS X employs Virtual Memory (VM). This includes dynamic paging: maximizing available RAM by moving data from RAM to swap files on the startup disk and back. The less RAM you have, the more CPU cycles and free space on your startup disk are devoted to paging and swap files, respectively. 2. Click the System Memory tab. The System Memory pane appears in the lower section of Activity Monitor. Your Mac has insufficient RAM for your workload. One or more of the applications you are using has a memory leak, a bug that only the developer can fix. If you suspect a memory leak, notify the developer and refer them to the "Finding Memory Leaks" chapter of the Apple Developer Connection document Memory Usage Performance Guidelines. Advanced users who have installed Xcode can attempt to a find memory leaks in a specific application using the MallocDebug performance tool. The left side of the System Memory pane shows memory use in different categories. To see the definition of a category , hover the mouse pointer over the label, e.g. Free, and a help tag will appear. The categories are also defined in the AppleCare Knowledge Base document "Mac OS X: Reading system memory usage in Activity Monitor." Of these categories, Free and Page Outs are the most important. If Free is low and Page Outs is consistently high during your work day, more RAM will help. The right side of the System Memory pane shows a pie chart of RAM usage. As noted earlier, more green  Free RAM  is better. If the green section is a sliver, more RAM is recommended. 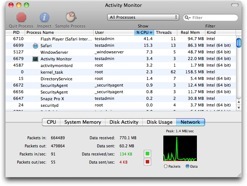 In Activity Monitor, choose View > Dock Icon > Show Memory Usage. Control-click the Activity Monitor icon. To remove all doubts about the adequacy of the RAM installed in your Mac, you can use Terminal to check an important RAM statistic that is omitted from the System Memory pane: page-ins and page-outs per second. This will further rule out slow performance due to thrashing, a condition where Free RAM is so low that paging monopolizes CPU activity. See our "Problems from insufficient RAM and free hard disk space" FAQ for details. If Free RAM is low, thrashing will also show up as persistently high values in the Disk Activity pane of Activity Monitor. See "Checking disk activity" later in this FAQ. If your Mac needs more RAM, add as much RAM as your budget will allow, up to the limit your Mac will accept. You can never have too much RAM. Some may ask whether a shortage of Free RAM indicates the need for more RAM; they may argue that available RAM is a better measure of RAM sufficiency. Available RAM is the sum of the Free and Inactive memory shown in the System Memory pane. Free RAM is just that: RAM that is not being used. Inactive memory lives in a twilight zone between Free and Active memory. Whether memory is Active or Inactive depends on how recently it was accessed, where recently is defined by undisclosed parameters of the VM system itself. For example, memory allocated to the current  frontmost  application that you are using is included in Active memory. Memory allocated to applications that you have opened, but not accessed recently, may be included in Inactive memory. If you switch to an application whose memory is Inactive, that memory becomes Active. If Free memory drops below a certain threshold  again undisclosed  the VM paging system frees Inactive memory via a page-out, copying some of the contents of Inactive memory to disk by writing them to a swap file, then switching that Inactive memory to Free memory. If you switch to an application whose allocated memory has been paged-out to a swap file, Active memory must be allocated for a page-in, where the contents of that application's memory on the swap file are copied back to RAM. Depending on the amount of Free memory, a page-in may first require more page-outs from Inactive memory to swap files. For ideal performance, your Mac should have enough RAM that paging is unnecessary. When paging becomes excessive due to insufficient Free memory, thrashing can result. 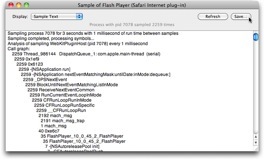 The "Memory Management in Mac OS X" chapter of Memory Usage Performance Guidelines. The "Memory and Virtual Memory" chapter of Kernel Programming Guide. Free space on your startup disk is important if your Mac has less RAM than your work demands. Free space is required for the swap files used in managing VM and for the scratch or temporary files often employed by multimedia editing applications. A lack of free space, especially when combined with insufficient RAM, can lead to poor performance due to thrashing, as well as host of other problems. 2. Click the Disk Usage tab. The Disk Usage pane appears in the lower section of Activity Monitor. Choose your startup disk  normally Macintosh HD  in the pop-up menu on the left side of the Disk Usage pane. 4. Check both the pie chart and the value of the Space free field. By default, free disk space (Space free) is shown in green; the larger this section of the pie, the better. If this section is reduced to a sliver, or if the value of Space free is less than 10 GB, the free space on your startup disk is virtually exhausted. If the startup disk has insufficient free space, attempt to free up space by following the advice in our "Freeing space on your Mac OS X startup disk" FAQ. As a rule of thumb, 10 GB is the minimum amount of free disk space, but far more is better. Otherwise, you will need to upgrade the startup disk in your Mac to a larger hard disk drive. If free startup disk space is visibly and significantly disappearing during your work day that cannot be explained by normal activity, such as new files you are creating or downloading, then an errant process may be writing incessantly to Console logs. See "Checking disk activity" later in this FAQ for details. 2. Click the Disk Activity tab. The Disk Activity pane appears in the lower section of Activity Monitor. Thrashing, if Free RAM is also low in the System Memory pane. You Mac requires more RAM. An errant process writing incessantly to Console logs if the Space free value for your startup disk in the Disk Usage pane is inexplicably shrinking both visibly and significantly during the day. Check Console for clues, such as large blocks of repeating messages being written to either the console log or the system log. From a troubleshooting standpoint, the Network pane of Activity Monitor may at first seem to be the least useful. Both Network Utility  located in the Macintosh HD > Applications > Utilities folder  and the Network Diagnostics feature of Mac OS X are more suited to troubleshooting network-related issues. Nevertheless, the Network pane can be useful in determining if unexpected network activity is occurring. Unexpected network activity can be due to anti-piracy features in applications as well as unauthorized transmissions from malware or spyware. 1.1. Quit all open applications that generate network activity: Web browsers, e-mail clients, chat clients, iTunes, and the like. 1.2. Open Sharing preferences and temporarily disable any enabled options. 1.3. If enabled, temporarily disable Bluetooth. 2. Open Activity Monitor, located in the Macintosh HD > Applications > Utilities folder. 3. Click the Network tab. The Network pane appears in the lower section of Activity Monitor. If you use chose Set date and time automatically in the Date & Time tab of Date & Time preferences, you may see an occasional blip when your Mac checks the specified network time server to synchronize its clock. If Software Update performs an automatic check for new software while you are monitoring network activity, you will see a spike in transmissions. This spike will be prolonged if updates are available, especially if you have also selected the option to Download updates automatically in the Scheduled Check tab of Software Update preferences. 5.1. Install Little Snitch 2 to help determine the source of the transmissions. 5.2. Check your system for malware or spyware using an anti-virus solution. 6.1. Open the applications you quit in step 1.1. 6.2. Enable options in Sharing preferences that were disabled in step 1.2. 6.3. Enable Bluetooth if you disabled it in step 1.3. Note that the # Ports, Messages Sent, and Messages Received columns  choices in the View > Columns menu  do not relate to network activity: they concern inter-process communication, i.e. communications between processes in the process list. Errant processes are those that interminably monopolize the CPU. By consuming CPU resources, they deprive other processes of their share, slowing performance and often resulting in frequent, protracted appearances of the SBBOD in all applications. The cooling fans in your Mac will eventually spin up as the CPU heats from the heavy  albeit useless workload it is performing. Processes can become errant when they are frozen or hung, either due to programming bugs or system-related problems, such as directory corruption. In the process list, the process' name will appear in red text with the phrase Not Responding appended and its % CPU value will be very high, e.g. near or exceeding 100 percent. In an application's Dock menu, the phrase Application Not Responding will appear if the application is frozen or hung. Processes can also become errant due to unsupported system modifications, such as installing third-party hacks, interface modifications, or menu extras. Errant processes can also result from improperly uninstalling third-party applications. For example, if a third-party application installed a Startup or Login Item and you deleted all of the application's other files except that one, that leftover may still be opened when you start up your Mac or log in to your account, becoming an errant process that hogs CPU cycles. Some processes may occasionally display high % CPU usage protractedly, but this situation is not necessarily a problem. For example, processes associated with Spotlight® can show an extended spike in CPU usage during indexing, a time-consuming activity. A Web browser may show high CPU usage while rendering or displaying multimedia content. If a process is using considerable CPU, but its name does not appear in red text, it may simply be busy; patience is a virtue. 2. Choose All Processes in the Show pop-up menu. Sort the process list in descending order by % CPU: click the % CPU column heading until the list is sorted in descending order. The processes consuming the most CPU will now be at the top of the list. Note: In some versions of Mac OS X, the % CPU column heading is labeled CPU. Only terminate processes you recognize and whose User is listed as a user account on your Mac. Other processes, such as those whose User is root, are system processes. Terminating system processes or those running in user accounts other than your own requires Admin authority. Terminating a system process may stop your Mac from functioning, necessitating a hard restart via the power button. Optional: take a sample of the process. Choose View > Quit Process. Press the Command-Option-Q keyboard shortcut. 4.3. In the confirmation sheet, click Force Quit. The selected process is terminated. Check the Westwind FAQ "Mac OS X: What Are All Those Processes?" Search the Apple Developer Connection for the process name. The function of the process should be explained in one of the resulting documents. Advanced users can also terminate an errant process by using its Process ID or Process Name in the kill or killall Terminal commands, respectively. If an application frequently becomes unresponsive, freezes, or hangs you can take a sample of it while it is in this state. A sample is essentially a snapshot of the code running in the process at the time the sample was taken. The sample can then be saved and sent to the developer for further analysis. Sort the process list by clicking the appropriate column heading (Process Name or % CPU) until the list is sorted in the desired order. Find a specific application or process by typing its name in the Filter field. A new window entitled "Sample of process_name" opens and a sample of the process is collected. 3. Click Save. A Save dialog appears. 5. Close (Command-W) the Sample window opened in step 2. A third-party developer Consult the developer's Web site for details on obtaining technical support for the application. Apple Submit a bug report. To submit an Mac OS X bug report, you must be either a registered Apple Developer or a paid member of the Mac Developer Program. Becoming a registered Apple Developer is free as of the time of this writing. Note that the Sample function in Activity Monitor provides a GUI to the Terminal command sample.  Problems from insufficient RAM and free hard disk space FAQ.  The Spinning Beach Ball of Death FAQ.